If you've found yourself in the predicament of having to eliminate gluten from your diet, there's no need to worry! 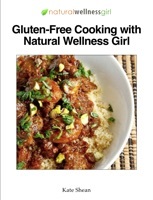 Natural Wellness Girl introduces its first gluten-free cookbook, showcasing cuisines from around the world that are full of flavor, color, and taste. All the recipes are easy and family-friendly (our kids love them! ), including breakfast, appetizers & sides, entrees, and desserts. Gluten intolerance does not need to be disabling, it can open your eyes to the world of great food - without gluten!